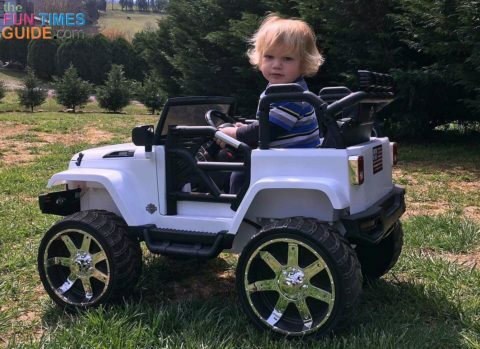 My mom and dad bought my son a very fancy and expensive ride on Jeep for his first birthday last year from Big Toys Green Country. At first he was slightly curious. But then he would start to cry if we ever tried operating it using the parental control remote while he was in it. So this fancy Jeep ride-on toy made its way to the basement, where it sat and collected dust for about a year. We tried to re-introduce it to him time after time, but he remained completely uninterested… until now! While working in our walkout basement garage, my son climbed in the Big Toys Green Country Jeep and told me he was ready to go for a ride (in a language only a mother can understand who spends every day with her 2-year-old). I busted out the remote from under the hood, started up the Jeep, and away we rode. 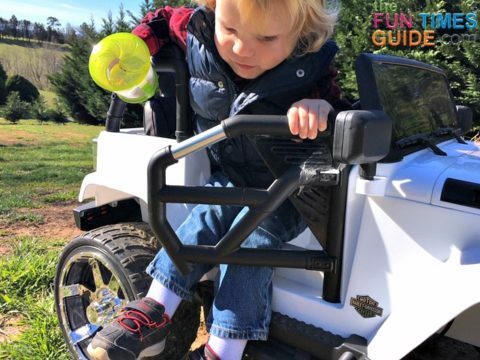 He acted as if he had been riding in the Jeep for the entire year it sat there unused — and now he wants to ride it every time we’re playing in the yard! 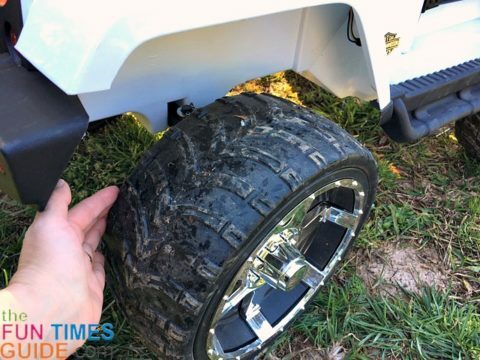 #2 – We got the 2WD version, but there is also a 4WD option. The body of the Jeep has 9 inches of ground clearance and an actual working 4-point suspension. #3 – The Jeep itself has great styling and scale detail — which allows my son to imagine he’s driving the real thing. #4 – The interior has a luxurious extra-wide 16-inch leather seat with a 5-point harness seat belt. #5 – The dash has backlighting and a push-start button with start up sounds! #6 – There’s a mock radio with AUX/MP3 input — so we can play our own music. The radio comes with some preset built-in kids music and stories. The steering wheel has a button to control the presets and the horn. #7 – There’s a direction shifter with forward & reverse and 3 speeds to choose from (varying 2 to 5 miles per hour). 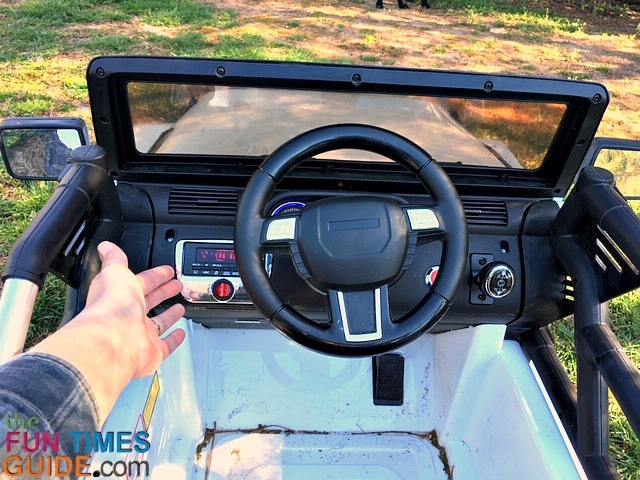 #8 – The Big Toys Green Country Jeep has tube style doors that open and close with magnetic latches. 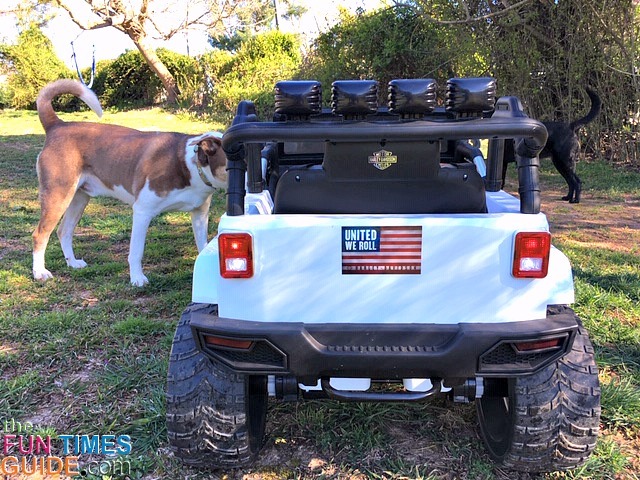 #9 – There is a slide-out, built-in handle on the rear bumper — for easy manual maneuvering of the Jeep. 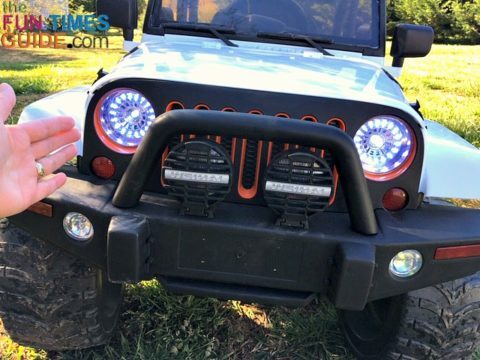 #10 – This ride-on Jeep has cool LED headlights with Halo light rings, running lights, and tail lights operated by a toggle switch on the dash. #11 – There is a large, rechargeable 12V battery with a wall charger. But we upgraded to a smart trickle charger — to ensure safe charging of the battery, in case we forget to unplug it for a few days. #12 – The approximate running time is 45 to 95 minutes — although we’ve never had a driving session last that long, due to my son’s attention span at the age of 2. 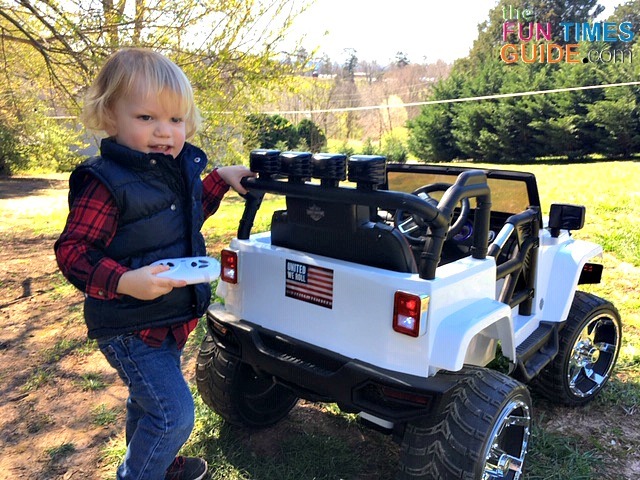 #13 – The parental remote control on the Big Toys Green Country Jeep is super important to me. It has a fail-safe — meaning the vehicle will come to a complete stop, if it loses connection with the remote. There is also a super-important emergency stop button that allows me to “apply the brakes” (completely stop the Jeep) if my son starts driving into a hazard beyond his comprehension. 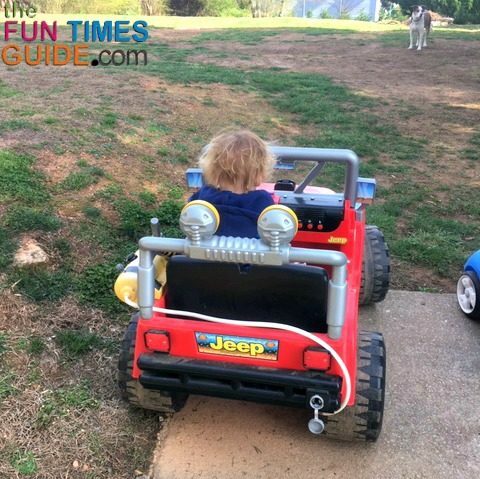 As a 2-year-old, my son can’t maneuver the Jeep by himself just yet (although he does once in a while) — so I get to join in on the fun in the meantime, by deciding mostly where he is riding to. So I’m basically controlling the speed and direction of a giant remote control car with my son in it. (The remote control has these features: Forward, Reverse, Left, Right, Speed and Brake/Stop. One day, my son will drive the Jeep all on his own. I really like that it is dual function in that regard. Our Jeep seems to lose immense power on any sort of incline — which is basically the majority of our backyard. My husband and I are Harley people — so, of course, we always want our machines to go faster. Although this ride-on Jeep allows for some other forms of customization, I think the main circuit board limits any speed modification. In fairness, I’m sure Big Toys Green Country wants the kids who are riding their products to be safe — so I’m probably a little more accepting of their answer, compared to my husband. I think the speed of this Jeep ride-on toy is just fine on smooth and flat surfaces. The Big Toys Green Country Jeep also has a safe start — which starts out slow and builds up the speed gradually. My husband doesn’t care for this feature, but I think it’s safer than the immediate fast start that’s found on most Power Wheels ride-ons. In general, we have had a pretty good experience with our Big Toys Green Country Jeep! It shipped right away, and the shipping was free (or at least included in the price). We had a cosmetic issue with the chrome flaking on the wheel covers when my husband first assembled this Jeep ride-on toy. Big Toys Green Country sent us a replacement wheel cover right away. Exclusive Big Toys Green Country products come standard with lifetime tech support — which has been very responsive in addressing our questions. They carry replacement parts for all of their toys in stock (for their customers only), and there is a 1-year warranty on parts included in their products — excluding batteries, tires, and chargers. 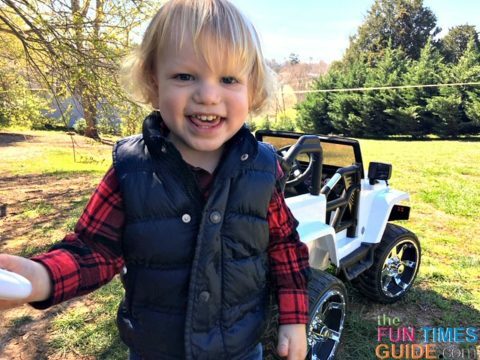 Overall, I’m satisfied with this ride-on Jeep, because safety is my main concern for my son. I think the unit is quite nice, and my son really seems to enjoy riding in it. Plus, it’s yet another fun activity for us to enjoy while being outside!